This time I attended the Critical Mass in Augsburg again – roughly estimated about 30-35 people. A bit over one and half hour and a quite chilled tour. Thanks to the nice weather it was also not too cold and it’s also nice that it’s not getting dark so soon in the evening any longer (at least the departure was at daylight – on the picture we were already on our way for a while). The tour was generally quite relaxed, even though there are always some car drivers who think they are the more important part of the traffic – and eventually have to wait anyway ;-). 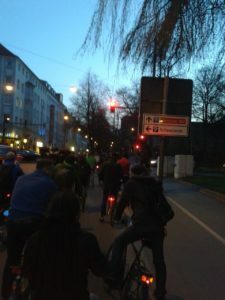 Just at the end there was a little discussion in Maximilianstraße with a traffic patrol since two of the participants on their mountain bikes didn’t have lights and the gentleman also assumed that we held an illegal demonstration. But eventually this could also be settled and didn’t have any consequences. The track for that is also available again on my GPX viewer.